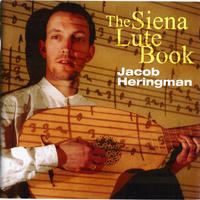 The American-born lutenist Jacob Heringman studied with Jakob Lindberg at the Royal College of Music in London, and later with Pat O'Brien in New York. Based in England since 1987, he has established himself as one of the world's most respected and most innovative solo lute players, and as a much sought-after ensemble player performing regularly throughout Europe and North and South America, and making many CD and radio recordings of medieval and renaissance music with leading English ensembles, including The Rose Consort of Viols, Fretwork, Musicians of the Globe, The Kings Singers, The New London Consort, Virelai and The Dufay Collective. As a continuo player, Jacob Heringman performed and recorded with The King's Consort, The English Baroque Soloists, The Parley of Instruments and The Taverner Consort, among others. In 1993, he left the continuo circuit to focus on renaissance solo and ensemble projects. Jacob's playing is also to be heard on the soundtracks of many Hollywood films (including Harry Potter III , Kingdom of Heaven and Ridley Scott's Robin Hood), and occasionally on pop albums (most recently, Joni Mitchell's Travelogue). 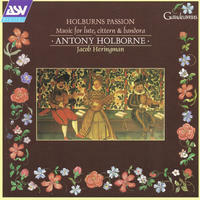 As a soloist, Jacob released his first CD, Holburns Passion: music for lute, cittern and bandora by Anthony Holborne, on the ASV label in 1998. This disc was chosen by Gramophone Magazine as one of the best CDs of 1999, and given a rosette and three stars in the Penguin CD guide. Early Music: "an unusual disc combining sparkling virtuosity with carefully paced musicianship". 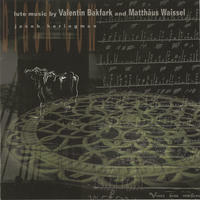 Jacob's second album, Lute music by Valentin Bakfark and Matthaeus Waissel, was Jacob's first appearance on Robert Fripp's DGM label. Renaissance Magazine: "a dedicated, disciplined, and courageous talent". 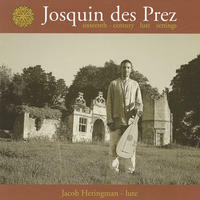 His third album (again for DGM), the first lute CD ever to be devoted to the music of the great Josquin Des Prez, was released in the summer of 2000, and has received numerous superlative reviews, noteably in Gramophone and BBC Music Magazine. It had already attracted attention and a cover story in Early Music Today even before its release. Goldberg: "Heringman's playing, recorded with vivid immediacy, is both musically sensitive and technically highly accomplished. Strongly recommended." 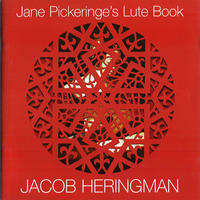 Jacob's fourth solo CD is on the new AVIE label; entitled Jane Pickeringe's Lute Book, it was released in June of 2002, and has also been highly acclaimed in the music press. Music Week: "It is impossible not to marvel at the dexterity of Heringman's finger work and very easy to be convinced by his inspired phrasing and winning sense of spontaneity." The Independent: "Deliciously wanton yet sensitive playing". 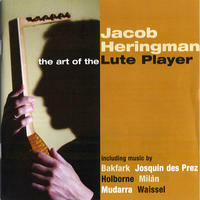 A fifth, entitled The Art of the Lute Player, was released in October 2002. This disc is a compilation of material from the first three solo CDs, plus solo tracks from the ASV Milan and Mudarra albums made with the singer Catherine King (see discography page). Gramophone: "The supple expressivity of the performances reflects Heringman's love of the music. What more is there to be said, other than to urge anyone with an interest in this small but very lush musical pasture to buy it without delay." Jacob's sixth and latest solo CD is now out on AVIE (0036), released in the spring of 2004. The American Record Guide: "Heringman brings this music to life with wonderful playing that is intimate, playful, and bold by turns." 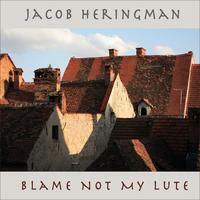 Goldberg: "an important recital"
Recorded and engineered by Magnatune founder John Buckman, Blame Not My Lute perfectly captures the warm, natural tones and relaxed yet elegant playing of world-renowned lutenist Jacob Heringman. Fifty eight instrumental tracks are exceptionally soothing and are perfect for any time you'd like to bring a little peace into your day. Recorded and engineered by Magnatune founder John Buckman, in this recording, Jacob presents a small selection of pieces from Neusidler's published books, with the intention of showing something of the variety of his musical output. His first work (Ein newgeordent künstlich Lautenbuch, 1536) is represented by tracks 2, 8, 9, 14, 17, and 25. His second (Part 2 of the previous book, also 1536) is represented by tracks 1, 10, and 23. 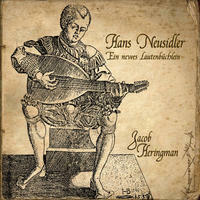 From Ein newes Lautenbüchlein (1540), I have included "Passa mesa" (Passamezzo), track 24. The remaining pieces are taken from Das erst Buch (1544). Jacob has given solo recitals throughout Europe and in North America. In recent years, he made numerous tours of the USA and Canada performing both the Josquin and Pickeringe programmes. As an accompanist, Jacob Heringman has performed and recorded lute songs with Michael Chance and Barbara Bonney, among others. He is also half of a duo with the mezzo-soprano Catherine King, with whom he has toured extensively and recorded four lute song discs for ASV and Linn, all of which have been greeted with high praise from reviewers. One of these, entitled Airs de Cour, for which the duo was joined by the tenor Charles Daniels, was voted one of the top CDs of 1999 by both Gramophone and the BBC Music Magazine. In 1990, Jacob founded the group Virelai with viol player Susanna Pell, singer Catherine King, and flute-player William Lyons. Virelai specialises in music of the late fifteenth and early sixteenth centuries, with occasional forays into modern music. Virelai has made three CDs for Virgin, and a BBC Music Magazine cover CD. A CD of specially commissioned modern settings of renaissance love poetry, entitled Sad Steps, was released by Riverrun Records late in 2002. Jacob teaches the lute at Trinity College of Music, London, and at York University. 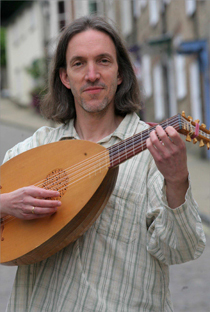 He is increasingly in demand as a teacher at various Lute Society and other early music summer schools, including the American Lute Society's courses in Vancouver, Cleveland and Amherst, the UK Lute Society's course at Hengrave Hall, and Musica Antiqua's course at the Cambridge Early Music Summer Schools. The Alexander Technique is another important strand of Jacob's life and work. A year ago, he finished the three-year full-time Alexander Technique teacher training course at The Alexander Technique Studio in London, run by Karen Wentworth, and is now a qualified teacher of the Alexander Technique certified by the Society of Teachers of the Alexander Technique (STAT). Increasingly, Jacob has found principles of the Technique to be indispensible in his music-making and teaching, and he is teaching the Alexander Technique to increasing numbers of musicians and non-musicians alike. Jacob is married to Susanna Pell, of Fretwork and The Dufay Collective, and they live on the edge of the Yorkshire Dales with their young daughter, Edie. Jacob Heringman lives in Richmond, England. Tagged as: Classical, Renaissance, 크레이지슬롯 사이트Instrumental, 크레이지슬롯 사이트Composer: Albert de Rippe, Composer: Alonso Mudarra, Composer: Anthony Holborne, Composer: Balint Bakfark, Composer: Hans Neusidler, Composer: Josquin des Prez, Composer: Luis de Milan, Composer: Luis de Narvaez, Composer: Matthaeus Waissel, Lute.